The Volkswagen Jetta has maintained a loyal following ever since its creation in 1980. The all-new 2019 model upgrade has taken that popularity to new levels, so it's understandable if you're anxious to finally drive one home, even if you already drive a 2018 model. If that's you, then you're in luck! 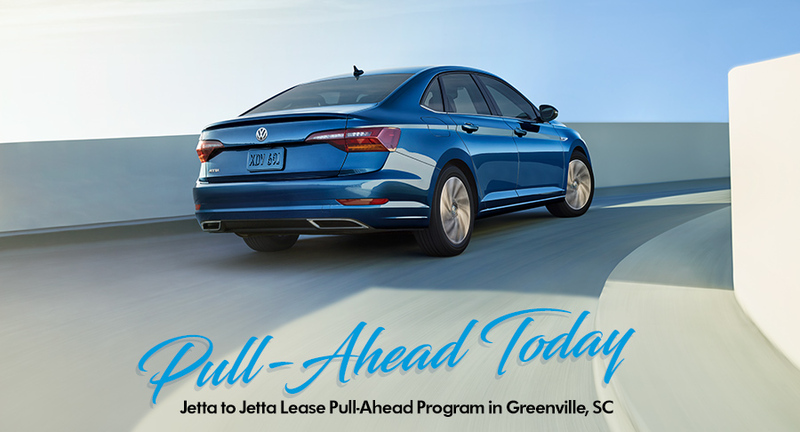 For a limited time, you can take advantage of Volkswagen's Jetta to Jetta Lease Pull-Ahead Program and make your dreams come true. Learn more about this amazing program below! -For qualified lessees with maturity dates between October 1, 2018-March 31, 2019. -Jetta models only, does not include TDI. -Volkswagen Credit will cover up to four remaining monthly payments when a Jetta owner finances or leases any New VW Jetta through Volkswagen Credit. If you'd like to take advantage of this program, please feel free to contact us directly or stop by our dealership at 100 Duvall Drive,Greenville, SC 29607. We look forward to serving customers from Asheville, NC, Columbia, Spartanburg, Anderson, SC, and throughout the Upstate.